Matija (23) was born in Mississauga, lived in the United States for a brief period of time when he was young, and then moved back to Canada. In August of 2017, he moved to Croatia. Where in Croatia do your roots lie? My father is from a village close to Siroki Brijeg, Hercegovina called Izbicno. I grew up with a strong Croatian identity due to the Croatian community in Canada. Was Croatia a part of your life when you were living in Canada? I was fortunate enough that I was able to come to Croatia many times every year. This love for Croatia was always ingrained in my family. My father’s story truly inspires me every day and it makes me realize that coming back to Croatia was not just because I wanted to, but it is something that every Croatian needs to do to appreciate and remember all the sacrifices that were made for our culture. My father left Hercegovina, then Yugoslavia, when he was 13 years old on a tourist visa. My great uncle convinced my grandparents that they should send one of their children to come live with them in Canada since it would relieve the burden of not having enough. Being part of a family of 7, the government subsidized every family equally. That meant if you had a bigger family you received a smaller ratio of food per person per household. Since my father’s family had 7 members the subsidization did not go very far. With political pressure and little money, my father left to live in Canada with his aunt and uncle. The Yugoslav government was suspicious of why my father left at 13, and the police would give him a hard time upon his return, including interrogating him when he came back to Yugoslavia, within a day of his return. When he was 20 years old, the Yugoslav police actually asked him to become an informant for them among the diaspora. My father being the proud Croatian that he was and knowing the risk of the ramifications of refusing, said no. He then demanded as a Canadian Citizen to be returned to his parents. I would not say that it is a ‘rags to riches’ story, but in comparison to where he lived in Hercegovina, it is the difference between living remotely 50 years ago the modern state of Croatia. He told me many times he remembers when electricity came to the village and how they had dirt floors in the house. He told me stories about in Hercegovina, it was highly discouraged to practice the Catholic faith. He told my brother and I that after World War II, two of his uncles on the coldest day of the year were martyred by the Partisan army. Even though they would have to work on Easter and Christmas, nothing could change what they believed in. The oppression of the Catholic and Croatian identities for many years in Hercegovina probably explains why he is so strong-willed. I will never forget when we were coming home from Croatian School one Friday night and he told me that even though he had almost nothing, his family was always happy that they had each other. Many years of oppression in Hercegovina highlighted what was important. It made me realize at a really young age that having nice things will never make me happy, but rather the people with whom I will share my happiest and saddest moments will. My father has, without question, the biggest heart of everyone I know. Hercegovci are loud, strong-willed and the kindest people on Earth. My father taught me the true value of helping someone else and not expecting anything in return. My father has never ceased to inspire me. He even returned to University to complete teachers college at the age of 39. Just as he inspired me at a young age, he now shares his wisdom every day in a classroom. I never really thought about it until now, but my mom did some amazing things to assimilate and to become a true Croatian. She learned for instance how to make Croatian food, her domaći kruh (homemade bread) is the best. When my parents were married for 4 months they went to Croatia on their honeymoon in June of 1990. They were on one of the first flights after Croatia became the Republic of Croatia, and she remembers everyone in the plane singing the national anthem of Croatia as it landed. On their honeymoon in Dubrovnik, she was there when they switched the flag of Yugoslavia to the Croatian flag. My father was so proud to share that moment with her, that the country that he always talked about with her, existed on paper. If that was not enough to convince my father’s family how much my mother assimilated into the Croatian culture, when my older brother was born, it was her that named him Krešimir. My mother took my brother to Croatia in the middle of the war and went through 2 army checkpoints to go see my father’s family in Široki Brijeg. I am blessed to have the mother that I do, someone who accepted all of who my father was and encourages him to be the best person that he could possibly be. I could not have asked for two better role models in my life than my parents. They showed me that there is not enough time in your life to be scared, and you can combat anything by having faith and a positive attitude. The Croatian Community in Canada is exemplary. Through my faith life, learning Croatian by going through the Croatian school system, playing soccer and playing tambura, there were many organizations that one can choose from to bring their talents into the Croatian Community. One special organization that definitely helped me with my move to Croatia was the Canadian Croatian Chamber of Commerce (CCCC). 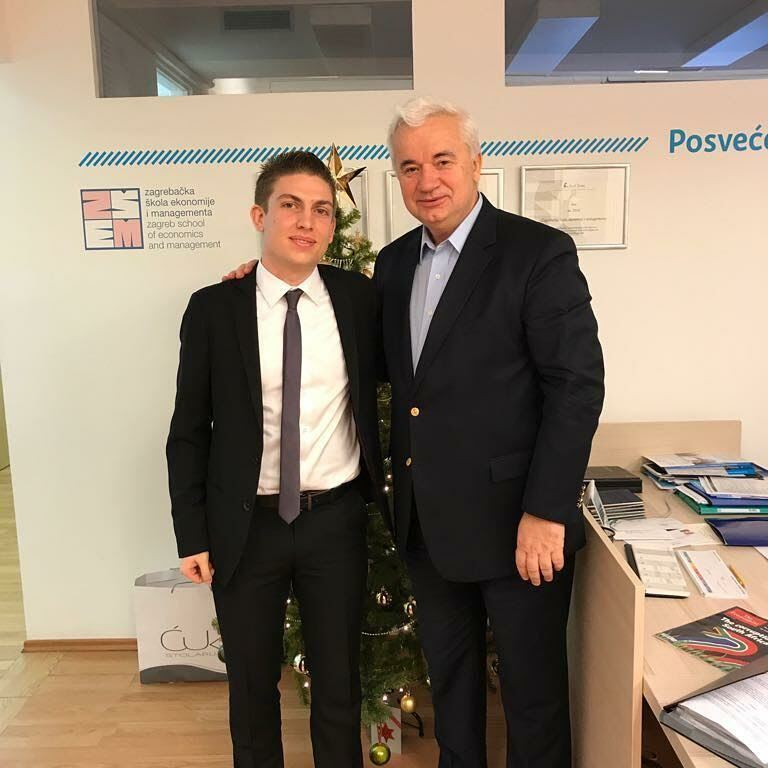 The people in that organization work tirelessly to promote the Croatian culture, especially President, Ivan Grbesic and Manager, Wanita Kelava. They promote business ties between the diaspora and the homeland and introduced me to so many inspiring people at their Business Award Galas. I feel really fortunate to have lived in a city where there was an influential Croatian community. Within a 20 km radius of my house, there were 3 Croatian churches. Wherever I lived in Southern Ontario, even when I moved away from home for university, there was a Croatian church nearby that I would go to on Sundays. I even was a member of their folklore groups. The preservation of Croatian culture, even in the smallest of communities in Canada, is incredible and without them, I would not be the person that I am today. There are many aspects about who I am that was developed by partaking in such a strong cultural community. The main thing that kept me grounded to the Croatian culture, besides coming to Croatia each summer, was Croatian Folklore. From a young age, I participated in Folklore seminars lead by Sinisa Leopold, Conductor and Director of the Croatian Radio and Television Tamburica Orchestra. We should be proud of our folklore. It tells the story and history of who we are and it is one of the most diverse pieces of cultural heritage any nation can have. The fact that our ancestors kept the traditions in times when it was discouraged to be Croatian is a testament to Croatian resilience and strength. By participating in folklore, we are honouring those who preserved our culture through song and dance. The Canadian Croatian Community knew the value of folklore and I am honoured that I was able to be part of it while I lived with so many others among the Croatian diaspora of Canada. during his talk “The Fight for Life in American Politics”. I always wanted to move back to Croatia. As I mentioned above, I was coming to Croatia up to 4 times a year. I even convinced my high school band to come to Croatia on our school music excursion. When people find out I was born and raised in Canada and I am only half Croatian they ask me,“ Why would you ever come back to Croatia?“ My response to them is always, Why not? Croatia is my home, is that not enough to come back? I think that unfortunately, people believe that life is always greener on the other side. I love Canada, and there were many opportunities that I have been given because of my upbringing there. 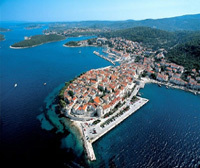 However, only Croatia can fill my heart’s desire to the fullest. I decided since I am young, I was in the perfect position to immigrate. It has been my goal to learn the most about the Croatian system as possible by going to school here. The CCCC put me in contact with so many amazing people from Croatia and from the Canadian Croatian Community. So many of the Croatian diaspora are truly successful in Canada they range from doctors and lawyers to CEOs, executive directors, and politicians. One moment that changed me was Kolinda Grabar Kitarovic’s visit to Canada in November of 2016. At this point, I was finishing my Bachelor’s degree in Music Composition. I was pondering whether or not music should be my fulltime job or just a hobby on the side. It was hard for me to decide since I had at this point received numerous scholarships and I was even chosen to replace my mentor professor as a teaching assistant. So I felt that music was a real possibility for me. On one of the last days of her visit, the CCCC had a banquet to fundraise for the renewal of the water tower in Vukovar ‘Kanada za Vukovar’. Canada raised over $200,000 for this purpose. In Kolinda’s speech, there was one statement that stayed with me to this day. She said, ‘How can southern Ontario, a land of not many resources, create such a great economy for itself and Croatia with so many resources cannot?’ I still ask myself that question to this day. 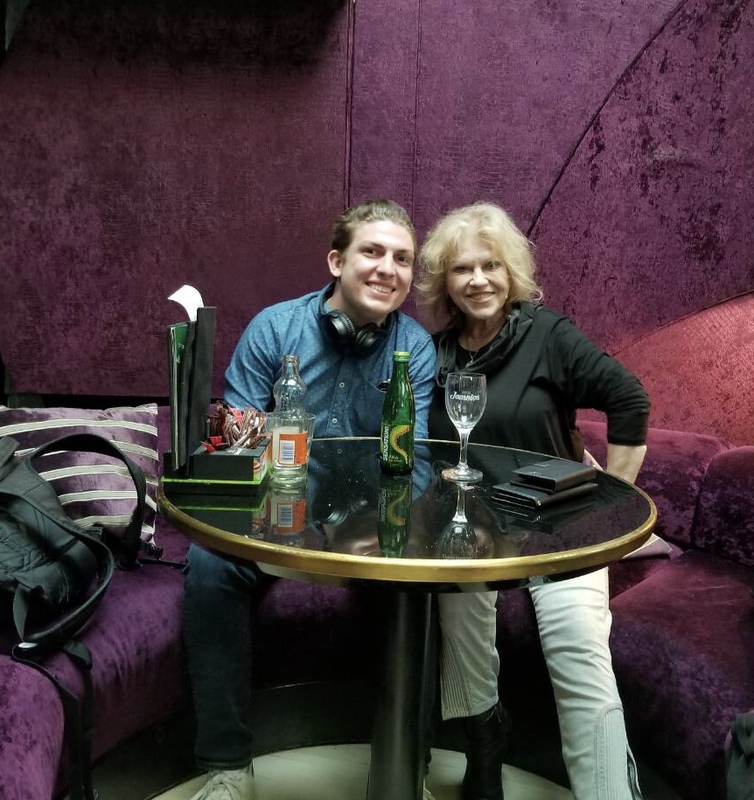 A year ago, during our reading week holiday, I decided to buy a cheap plane ticket and visit my mom. She had cancer for the second time and she was recovering in Zagreb. Zagreb to her is a peaceful place and our apartment always makes her smile. When I was here in Zagreb, my mom encouraged me to check out some schools, maybe I could finally fulfil my dream of moving back. I heard about a school on Jordanovac here in Zagreb, and I went there with my mom. The rest is history and now I have nearly completed my MBA. What was the reaction from friends and family? Most of my family was very encouraging, especially my immediate family. Many people knew that I was happiest when I was in Croatia. My friends were not surprised, many said they were surprised that I did not move back to Croatia earlier. Where are you living and what are you doing for a living? I live in Zagreb and I work as a Liaison for International Relations for the Zagreb School of Economics and Management (ZSEM). The big project that I am working on right now is trying to engage the diaspora to come back through education. In my opinion, if Croatia wants to combat their demographic challenge I believe that we should tackle the situation by bringing back young people. We are trying to engage the diaspora to return even temporarily to exchange the benefit of other successful cultures into our own. We hope that other schools in Croatia will do the same and then we can make the situation competitive. The second project that I am involved in and I feel privileged to be a part of is Stablo Znanja. It is the first technological and startup hub at the student center in Zagreb. Within the past several months, Stablo Znanja has held many seminars and we are now trying to expand to other cities in Croatia. Marko Komericki, the founder of Stablo Znanja, wanted to create a space for students so different organizations can have a central place to meet. We have been trying to encourage entrepreneurship as an option for students with ideas. We would like to start a venture fund and create competitions for these startup funds. One of the ways that we will attract international investors in our project is on our website called OneCroatia, where we will sort all the paperwork to start a project in Croatia. My team consists of an Australian Croatian, Andrian Juric, and the co-founders of Stablo Znanja Marko Komericki and Tomislav Jantol. 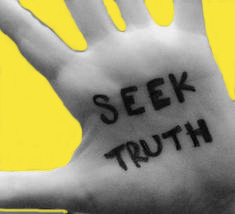 We believe that by being transparent and helping people know the processes of each region of Croatia, to buy land or other business acquisitions, we can either help people start a business in Croatia, or help start a discussion on how we can fix existing problems that hinder successful business in Croatia. We hope that by leading others into good business practices we can share our information, attract investors and stakeholders that can help strengthen the Croatian economy for the future. We also believe that Croatia is a small enough country, we can sort the important information needed for investment using an online database. If the homeland wants to be successful, we should realize that the courage that entrepreneurs bring to the table is going to bring us forward. What do you like about the lifestyle in Croatia? God and family come first. I work almost constantly because I believe that there is nothing more fulfilling than to contribute to the Homeland. I go out with friends and family every once in a while. People here appreciate their family, and they put them above all. Oddly the way everyone is here is the way my family was back in Canada. What 3 things do you miss about Canada? My mom, tata and my brother. What bit of ‘local’ advice would you give to someone visiting Croatia for the first time – what should they see? I would suggest to them to know that they are safe. Do not hesitate to ask locals what is good, because more likely than not they will know where to go. All of Croatia is beautiful but I tend to like the hidden gems more than the hustle and bustle of the tourist traps. If there is one place I would suggest for an all-around Croatian experience that would be Sv. Jana. It’s a small collection of hamlets north-west of Jastrebarsko or west of Zagreb. The bottled water that you usually buy in Croatia is Jana water. One can tell by visiting Sv. Jana that it is an Aqua rich part of Croatia. I usually bring the international students that come to ZSEM to Sv. Jana because it is a secret gem just a short drive outside of Zagreb. Are you happy you moved? Do you plan to stay? I plan to stay. I am determined that all of the barriers that everyone talks about are actually huge opportunities. I also plan to encourage others to do the same, to come back to Croatia. I watched an interview a few days ago on Croatian Radio and Television about the 15,000 Croatians who now live in Ireland. Many of them said that they love Croatia, it is their home. I always think of the situation in Croatia like a Fortune 500 company that has a high employee turnover rate. Most of the time, people tend to leave a company because there is no upward mobility and people do not like the work environment they are employed in. To stay in Croatia is an honour, and I plan to help in managing the problems in the ways that I can contribute. What advice would you give to anyone thinking of moving to Croatia to live? Over the past few months, I have been in contact with many people who have moved back as well as many who are thinking of immigrating. 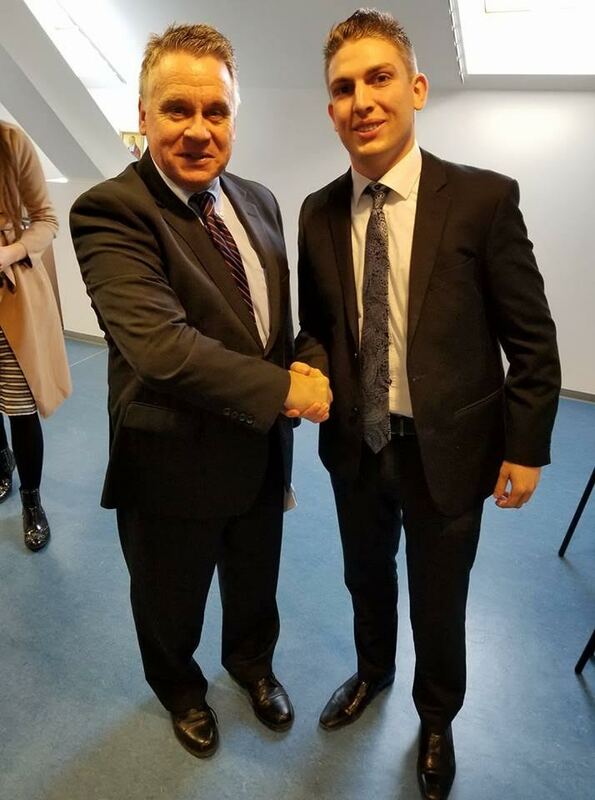 This past November I met US senator Chris Smith who wrote many policies during the Clinton administration concerning the US military intervention in Croatia and Bosnia. Whenever I am scared and start asking myself the „what if“ questions, I just remember what he told me: There is not enough time to be afraid. This, of course, does not mean do something without thinking about it, but rather never let fear hinder you while making decisions. Many will discourage you, even scream at you about your decision, but many of the most successful people were constantly told how wrong they were until they did something great. Thinking differently than the rest of society is a benefit and it gives you the ability to find solutions to problems that were once unsolvable. Thx for posting this fascinating interview with Matija! I’ve learned so much about Croatia from it + am also learning much about this fascinating country from your blog. A very resourceful and successful young man! Hopeful carrier opens the doors for many others who do not dare!!! TIES TO THE WORLD—A GREAT ER FUTURE! Great article….can you keep us updated in a year’s time!? I dreamed of living in Croatia, sadly everything seems too protracted and difficult when you deal with red tape and government – that is why so many of us have never returned.